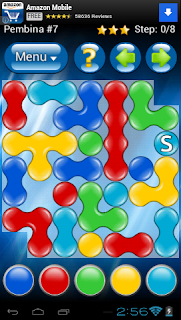 Mobile devices are home to many a puzzle game, with most being more or less slight variations of the others. Color Oil, while probably not the first of its kind, is a relatively fresh concept. Instead of blocks, columns, and the usual components, each screen starts as a jumbled mess of colored pools of oil. The goal is simple: make everything the same color. 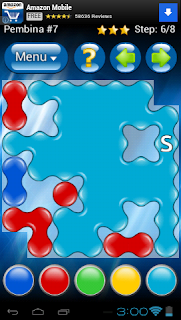 Play starts at a blob marked "S." This cell's color can be changed by pressing one of the six (five in the beginning levels) colored buttons at the bottom of the screen, causing it to merge with any identically-colored adjacent pools of oil. The challenge lies in completing the level in the minimum number of steps, yielding three stars, which are used to unlock additional level packs. For each step over the minimum, one star is deducted. 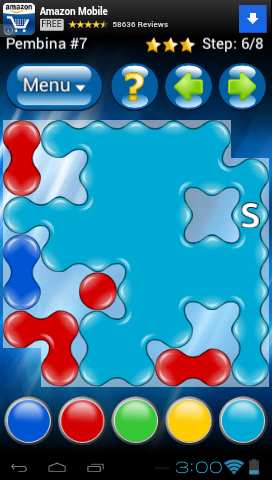 Color Oil is a logic puzzle game, meaning there is a well defined solution for each level. Instead of building something up, like combos in Bejewled or a tower of blocks in Tetris, players will have to logically deconstruct the level by visualizing the most efficient order of moves to reach a uniform pool of oil. While Tetris can be enjoyed forever, Color Oil's divergent gameplay style means the amount of content is limited by the developers' ability to come up with new levels. There isn't much room to criticize the mechanics of the game, but the interface could use some work. When trying to accumulate enough stars to unlock the next level pack, levels with one or two stars will have to be replayed, but if the level immediately following already has three stars, the player has to return to the main menu before selecting the next incomplete level. It would be less cumbersome to be able to pull up the current pack's array of levels at any time. It's a simple game, but don't mistake simplicity for lack of challenge. Color Oil's 190 levels (290 in the $1.99 Pro version) are sure to have players occupied until we're all flying around in hover cars that convert CO2 into rainbows.